For the first time the pigeon is up on two feet. I tried to get a good look at his legs, and for as much as I could see they looked okay, but I couldn’t see all of the legs and what do I know anyway? When I moved another box to one side of the box he’s in he pecked at the side of the box. He is without question more alert and active. I still haven’t heard from the pigeon rescue organization and I’m feeling anxious. I have to take Buddy to the vet this afternoon, and schedule Finney’s laser treatment. It’s all animal care all the time here. Definitely the pigeon is looking better. I wonder if he could have accidently flown into a wall or something, which addled him a bit? I have seen small birds occasionally fly into my glass patio door…fall and be momentarily stunned, but then recover. The way the pigeon’s leg looked yesterday, I thought it was broken — but obviously not if he’s standing on it. Sounds like my situation here too. 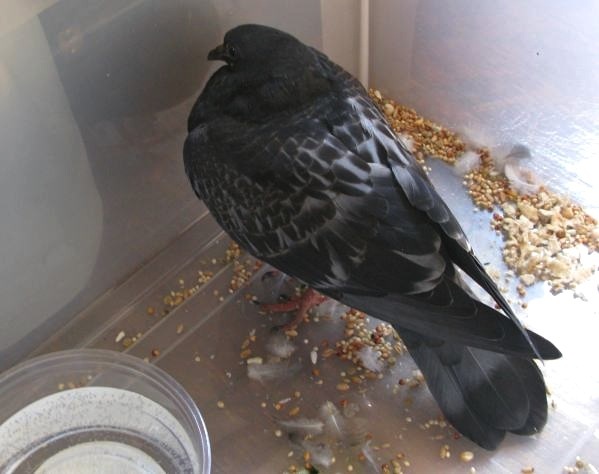 Good luck, hope you hear from the pigeon rescue group soon. I just got a better look and he’s standing up, but on one leg. He definitely has an injured leg. No one has gotten back to me from the pigeon rescue. Trying not to panic.